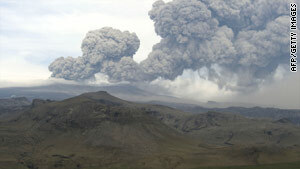 An ash cloud billows from the volcano beneath the Eyjafjallajokull glacier in Iceland on May 8. (CNN) -- Ash from an Icelandic volcano Tuesday shut down traffic at airports from central Spain to the Canary Islands off the coast of Africa, air traffic control authorities said. "At the current time, all airports on the Canary Islands, except Las Palmas, are closed as are some airports in Morocco," said Eurocontrol, the agency that manages European air travel. "According to the forecasts, during the afternoon, areas of higher ash concentration could move in a north-easterly direction cutting across the Iberian Peninsula and into south east France." Eurocontrol said there were 29,155 flights within the European area on Monday, which is not far from normal traffic levels.